The pattern of this printed cotton has been created with an engraved metal roller, and its additional colours built up using wooden rollers. 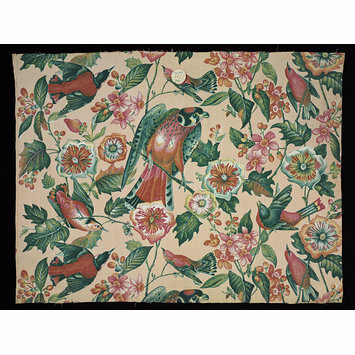 Roller-printing on textiles had been introduced in the late 18th century, and at first was used mainly for small-patterned dress fabrics. By the 1830s it had become a highly mechanised process, and had largely replaced block-printing in the production of fashionable furnishings. Many of the engravers of metal roller-plates were skilled draughtsmen. Joseph Lockett, one of the finest engravers working in the English industry in the first half of the 19th century, was largely responsible for the fashion in the 1830s for 'fancy machine-grounds', in which the whole background was covered with minute, elaborately engraved patterns. The illustrator John James Audubon (1785-1851) came to Europe from the United States in 1826 to find patrons and a publisher for his bird drawings. He was well received in Edinburgh and, after George IV subscribed for his books, in London as well. The London engraver Robert Havell undertook publication of Audubon's illustrations as The Birds of America in four volumes, between 1827 and 1838. One of the plates was used for the design of this textile. Furnishing fabric of roller-printed cotton in peach. 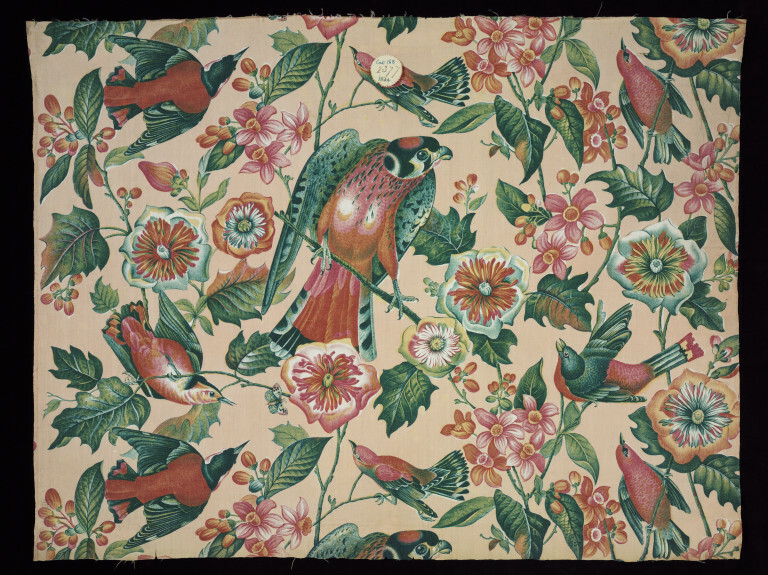 The pattern includes a design of birds and flowers. Additional colours added by surface roller.